The Three D Radio Top 20 + 1 charts ending April 1st is no joke, it’s Hunky Punks again! The punky four piece continue their reign upon the charts with ‘Fly High’. Making them a contender for the top 101 come January. Early bets are on Janet and the gang! The Three D Radio Top 20 + 1 holds strong this week with Juliette Seizure and the Tremor Dolls keeping the Number 1 spot. Its no wonder their at the top, after smashing out great sets Friday at Grace Emily and Saturday at Scumfest. Taking over from the Wireheads number 1 run on Three D Radio is Babes Are Wolves with their single ‘Wait’. Looking forward to seeing them launch ‘You Only Live Twice’ at The Jade on 16th Oct with Hey Lady (NSW) and Red Desert Ocean. Third week in a row for Wireheads at #1 on Three D Radio. ‘Big Issues’ is getting some good airplay! 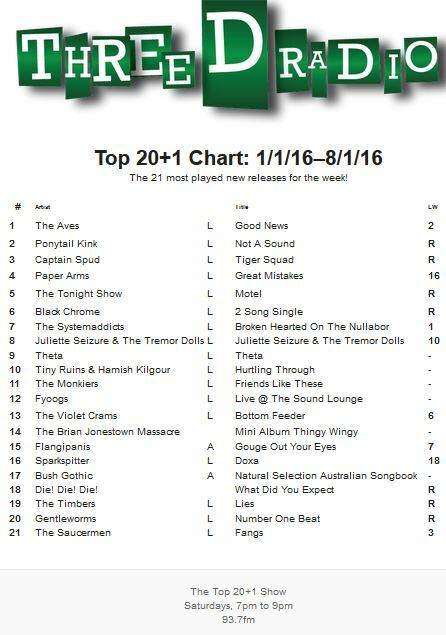 Nice to see more locals lingering in the top end of the chart too, including the much anticipated release by Babes Are Wolves. We don’t have to ‘Wait’ any longer…. (sorry). Wireheads recently ventured across the border to VIC to share the bill for a double EP launch with Old Mate in Collingwood. Now they return home to find their new release, ‘Big Issues’, sitting at the #1 spot on Three D Radio. Welcome back! We’ve had a good run of local acts at the top of the Three D Radio charts lately, but this week Thee Oh Sees come in straight at #1 with “Mutilator Defeated At Last”. We count no less than 8 local acts with debuts in this week’s Three D Radio airplay charts, and yes (our favourite thing), this includes the #1 spot. Gotta love this timing. With a blow-out EP launch over the weekend, West Thebarton Brothel Party hit the Three D Radio charts running, with a debut in the top position. We predict they’ll be hanging around the charts for weeks to come as well… watch this space! And Kitchen Witch are back on top! They’ve kept “Trouble” amongst the Three D Radio Top 20+1 charts for awhile now…. See, we told you William Street Strikers & Black Coral – we didn’t believe you that “Nothing” was happening…. Aww c’mon folks, are you selling things a bit short here? We’ve got a new release called “Big Nothing” at #1 on Three D Radio’s latest charts, and William Street Strikers’ “Nothing’s Going On” at #2. Let’s re-focus on #10 “Achievement”, by The Stress of Leisure, shall we? Talk about good timing… Stoner Blues & Roots Rock act Kitchen Witch launched their ‘Trouble’ EP on Friday 31 July, the very day it moved up to the top spot on the Three D Radio charts. The title track is the first single off the band’s debut EP, recorded at Wizard Tone Studios. Their new release confirms the latter, as it swings up to the #1 spot on Three D Radio this week. They continue to insist that their name has nothing to do with a certain former publican in Adelaide…but their photos indicate they do seem to love that pub, so the jury’s still out! Apparently they’re not vegetarian either, unless we’re reading too much into the title of their new release. If music blog Pitchfork rates it an 8 out of 10, you can consider that a release might be pretty darn good! Such is the case for compilation Punk 45: Extermination Nights In The Sixth City, which debuted at the top of the Three D Radio charts this week. We love it when a live recording at Three D Radio’s own Sound Lounge spawns a #1 release on the station. Yes, the band name is a bit politically incorrect… but hey that’s rock & roll! Congrats to local act The Dagoes for debuting at #1 on Three D Radio this week, with their new “Supreme” LP with a whopping 16 tracks. The Australian power pop release is out now through Light in the Attic Records.